When it comes to starting a fitness journey, success comes from planning. Personally, I know that when I am writing things down, I am being 100% conscious of my actions and how they will lead to my goals. It becomes more of a tangible, REAL objective versus a fuzzy, out of focus target floating around in la la land. You know what I mean?! So I wanted to come up with a way to make planning your fitness planning a lot more focused, organized, and of course…a lot more pretty :) Introducing, your FREE fitness planner printables! We designed them so that they’d be ink friendly but still fun to look at! I’d suggest you print these guys out, hole punch them, and put it in a binder! Or if you’re more of a display person…tape it to your wall or your fridge! Whatever works for you! I hope you use these printables over and over again! Living a fit and healthy life should be accessible to everyone, so my goal with these free fitness planner sheets is to help achieve that! If you find these useful, it would be the WORLD to me if you would share them with a friend. Check this out, Beth! This could be helpful! Amazing!!! I am a person that likes to have things planned and organized. this is amazing!!! thanks for sharing!!! Thank you! It is very good for me! this is one of my full spending time websites i loveeeee blogilates so much if this wasn’t created already i would totally have no idea what to do with my routine. how do I use the fitness planner? A habit tracker is something that helps you start and maintain practices that you want to do daily! For example, if you wanted to make your bed every day, you’d write that down in one of the slots and then check off when you did it for that day. You should add for example 20 sit-ups and you cross everyday you did them. That way you’re inspired not to break the habit you want to achieve. If I’m 122lbs and 1/2 that is 61. Do I drink 976 oz total of water in this month? Yesss cassey the Queen of Pilates! Thank you so much for the positivity encouragement and motivation. It would be wonderful to have workout alternatives/variations for those with knee injuries. Cassey, how do i use the habit tracker planner? How do I use al the planners? 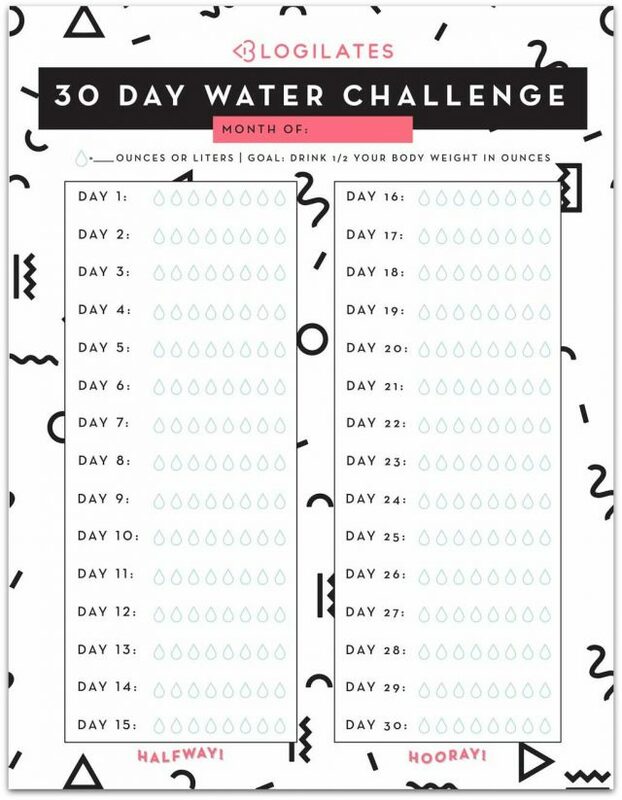 How does the 30 days water challenge helps/works? Some onfo please. Thanks. I love Cassey ! I look like a model but cuter cuz I am smaller size and I’m so strong strong! ^^ With your workouts it took 3 months and my knees have stopped hurting like from other gym activities! <3 I love how you shout with that voice!!! "come onnn!" and how you say "thank you for working out with me!" So powerful, so cute <3 Love Cassey!!!!!! I am so pumped to get myself in better physical condition. This is great. Thank you, they’re very lovely. I’m excited to be in healthy routine! I love it!!! You are so wonderful Cassey! So glad i came across this. I will support and participate in this. I’m loving this blog and can’t wait to try it out!!! I love your blog and everything that you do! Keep it up! Don’t worry, we’ve all been there! Just find something motivational. As for me, it’s a better body at the end of the month. I also like coloring sheets, you know, the big, time consuming, pretty ones with motivational sayings. You could do anot activits planner or something ? Thanks cassey for these pretty printable and workout routines! Habbits: brushing your teeth, being up by a certain hour, 30 mins of exercise, taking a shower, reading, journaling, spending time with friends, date night, etc- whatever applies to your life- things that are important. In the numbered boxes you put an “X” or a check mark to track if you did that habit for that day. Hope that helps! I like the idea of a habit tracker but am not sure what habits to track. Any ideas? Hi Brianna, I chose the habits related to yoga stretching and beauty stuff (if you are into this) such as flossing, essential oils, facemasks etc. Habbits: brushing your teeth, being up by a certain hour, 30 mins of exercise, taking a shower, reading, journaling, spending time with friends, date night, etc- whatever applies to your life- things that are important. Thank you for all of these beautiful templates Cassey! I appreciate it so much. OH MAN! I’m going to laminate the meal planner week sheet. I need to be so much better at meal planning and with a reusable one I think it’ll be more successful than printing it every month. Thanks Cassey!!! That’s a great idea. I think I will do the same for the workout calendar. Oh my gosh I LOVE THESE! Seriously!!! Amazing idea!! So fun and motivating!! Thank you so much! I love these, Cassey! Writing things down is so helpful for me, there’s such a satisfaction in being able to tick things off, too. I like all PDF sheets, specially “workout calendar” to every Blogilates video I’ve done, as I usually combine two or three parts of the body per day. So good!!! Hey Cassey! I love your bridal series. I am going to do the arm workout as soon as I make this comment. I think you should consider adding a sleep tracker as well. I’ve been coming across so many other dietitians, doctors, wellness folks starting to share their thoughts on SLEEP. It is the final piece to the puzzle to feeling great and i don’t think we give it enough attention! Thank you Cassey! I have to say, this was a very intelligent and thoughtful solution to the planner-pack-not-sending-to-email problem. I’ve been waiting for this for so long. It’ll be so motivating–making my own hasn’t seemed to suffice–and it’s super pretty. OMG! YES! Bless your sweet heart! I’m going on a beach holiday in the summer but I’ve never been happy with my body and have a lot of anxiety particularly when a situation that involves wearing swim suits but hopefully these will help me keep track so my anxiety isn’t so high when we go and I can just enjoy the holiday. Thanks Cassey! how do you use the habit tracker? Skye – you write down a habit you’d like to create, like maybe do 10min of yoga daily. Then every day you do it you check off a box. or you can say workout at least 3 days a week and check off those days; etc. its endless goal making! I especially appreciate the grocery list. Thanks Cassey! Thankyo so much for these been looking for so long ❤. I so love this! thank you! Thank you very much for your work!! :) It is lovely! I love this! This is awesome! Going to print out a copy and see where it takes me.